Design Your Computer Curriculum for your needs! Seriously! Do we still need to create a computer curriculum or teach computer skills to our computer savvy homeschooled children? Most of our kids have never lived without computers, never knowing a time without computers in the house. Also, as the internet is our first port of call when we want to research or find information, we will have to teach our children ways of researching other than the computer. Our children will grow up computer savvy, so we need to show them that books and libraries also have their place in research and that wiki is not the only resource they need. Perhaps the most important skill we want our children to learn is how to fix the computer when it crashes or the network is disabled or an error message decides to continually annoy us! Every family should grow at least one "computer technician" or "Network Support Manager". We joke around at home divvying out appropriate jobs for our children to make mum and dad's lives easier : We need an electrician, a plumber, a carpenter, a cook/house-cleaner, and definitely a computer expert! Just a few points before we discuss some important skills to include in our computer curriculum for our children. Make sure your computer is safe. Here's some free Computer Protection Programs - easy to install and very effective. K9 Web Protection is a free Internet filtering and control solution for the home. K9 puts YOU in control of the Internet so you can protect your kids. 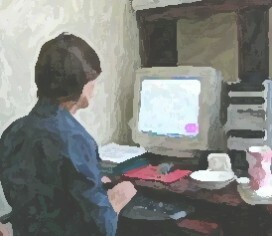 Set out family guidelines for the use of the computer according to age:- time, types of games, use of computer etc. Set up the computer in a visible location for the sake of accountability especially if the computer is connected to the internet. Use the computer as a tool and incorporate it across other curriculum areas. Be careful not to begin using the computer too early! Children will pick up computer skills very quickly and will not be disadvantaged if they are kept away from the computer formany years. They do not need to learn to use the mouse with "Click on me!" games. Maybe, as adults we may need to practice our co-ordination with a mouse, but our kids certainly don't!! They will, I believe, be disadvantaged if they do not have time to play, run outside, kick a ball and spend time outdoors. With young children, your priority should be on time to communicate, explore, walk, play, enjoy art and be together, developing character. Don't let the computer be a substitute for you - play games person to person, rather than computer to person! Copy their own handwritten narrations. Write reports/essays/poems/stories. Add images to work. Word 2007- 2010 Free Self-Paced Training Courses - scroll down from 2013 to 2010 and 2007 training. Incorporate the use of computers in any curriculum area by presenting a unit of study in a powerpoint - Can use images, text, and variety of effects. Also try the latest from Office: Sway - a great way to create interactive reports and presentations etc. Free E-Course: How to Build a Profitable Web Business. Sent directly to your e-mail box in 4 installments! This course helps you to work through some questions on building a web business either using WordPress or Sitesell SBI. by Harvey & Laurie Bluedorn. Check out Student Discounts for a whole range of software programs.